The wealth of natural beauty on display in Texas is world-famous, but the beauty that lies hidden beneath the surface is not as well known. Some of the fascinating caves in the state include the challenging Airmen’s Cave, which requires some crawling through narrow passages. 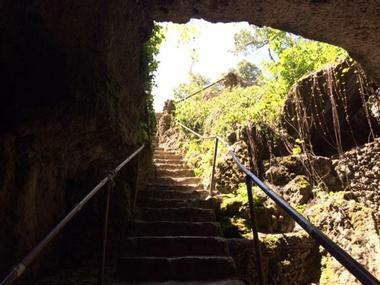 Bracken Cave is world-famous for its huge colony of Mexican free-tailed bats, while Cascade Caverns near Boerne has guided tours that take visitors 132 feet below the surface into the Cathedral Room. Cave Without a Name, TX is known for its spectacularly beautiful geological formations, such as stalactites, stalagmites, soda straws, and cave drapery. Jacob's Well has thousands of feet of flooded underground passages that are popular among cave divers. Bracken Cave is located just outside of San Antonio, Texas, at the bottom of a sinkhole created when the cave’s roof collapsed. The access to the cave is through the crescent-shaped 100-foot-wide opening. The cave is world-renowned as the home to the world’s biggest colony of bats. According to a rough estimate, more than 20 million Mexican free-tailed bats come to the cave from early March to the end of October to roost. 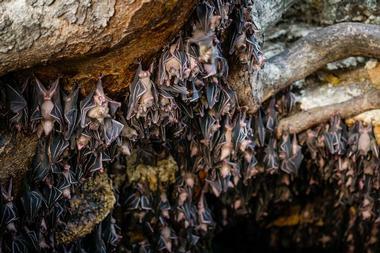 Austin-based Bat Conservation International owns the cave and the land around it. They restored the land and planted a range of native vegetation that supports a rich variety of wildlife. Access to the cave is strictly controlled to protect this rare habitat and the bats, but Bat Conservation International organizes guided tours to the entrance to the cave to observe the bats as they fly out of the cave each evening throughout the summer. 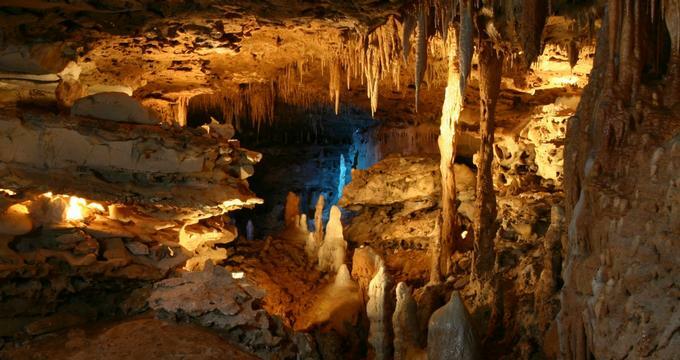 Cascade Caverns is a limestone cave located about 3 miles from Boerne, Texas. It has been run as a show cave since 1932 and the informal private tours have been organized since 1875 when the property with the caverns was owned by Dr. Benjamin Hester. Even before that, the Lipan Apache people, native to the area, knew about the caverns. Cascade Caverns were formed during the Lower Cretaceous Period and are part of the much larger Glen Rose Formation. Open to the outside world for thousands of years, the cave contains remains of mastodons and saber-toothed tigers as well as 18th century artifacts from the Lipan Apache. Cascade Caverns enjoy constant average temperature of 60-65°F. There is a 45-minute tour that runs through half a mile of corridors and chambers, going 132 feet below the surface into the Cathedral Room. Considered one of the most beautiful caves in Texas, Cave Without a Name is a living, natural cave located about 11 miles from the town of Boerne, in verdant Texas Hill Country. The cave’s main attraction is its spectacular formations, such as stalactites, stalagmites, soda straws, cave drapery, flowstones, and rimstone dams. The guided tour runs through the six of the most important rooms at a constant and pleasant 66°F. It is an easy, comfortable, and fascinating walk, brightly lit, and well maintained. The Cave Throne Room is famous for its acoustics and often hosts live concerts. The Caverns of Sonora is known as one of the world’s most magnificent show caves. Located about 15 miles from Sonora, between San Antonio and Big Bend National Park, the cavern is hidden below the cowboy boots and cattle hooves of ranch country, where the Chihuahuan Desert meets Texas Hill Country. The grounds around the entrance to the cave are a lively tourist destination with hiking trails, gold panning stations, and shops selling home-made fudge. Regular guided tours take visitors to see these amazing natural creations. What makes the cave so special and incredibly beautiful are the stunning calcite crystal formations, with helictites of incredible complexity and purity found in rare abundance here. Inner Space Cavern is located in Georgetown, Texas, and was discovered during the construction of Interstate 35 by the Texas Highway Department in 1963. According to the prehistoric animal remains that were discovered in the cave, there were several openings through which animals entered and became trapped in the mud. While several miles of cave tunnels have been explored, many sections remain unknown due to blocked passages. The cave was opened to the general public in 1966. Today, there are three different tours, from a basic guided tour to the challenging guided spelunking tour. The tours run through more than 1.2 miles of passage, but non-public passages are closed and well-guarded. Jacob's Well is fed by a perennial spring that flows off Cypress Creek, not far from the town of Wimberley, Texas. The mouth of the cool, clear spring is 12 feet wide and is used as a popular swimming spot for the locals who own the land near the creek. From the opening in the bed of the creek, Jacob's Well cave drops vertically almost 30 feet and then continues running downward through a series of chambers until it finally reaches about 120 feet. The cave system has been studied, explored, and mapped by divers from the Jacob's Well Exploration Project, and they have determined that it has two main passageways. One runs for about 4,500 feet from the surface and a second one continues about 1,000 feet from the point where it separates from the main conduit. The cave is extremely attractive to cave divers, but is definitely not for the inexperienced. Longhorn Cavern State Park is located in Texas’ Burnet County and is managed by the Texas Parks and Wildlife Department. It was opened to the general public in 1938. Longhorn Cavern, the main attraction of the park, is a limestone cave created by the work of a fast underground river a long time ago. The cave was known to and used for various purposes by Native Americans, Confederate soldiers, and outlaws such as the notorious Sam Bass. During the Prohibition, in the 1920s, the cavern was run as a speakeasy by the locals, with live music entertaining them every night. The Civilian Conservation Corps built Texas Park Road 4, pavilions, residences, and a popular observation tower in the park. They also thoroughly explored most of the cavern and made it more accessible by cleaning it and building walkways and stairs. Today, the cavern is once more used for concerts and theatre performances.